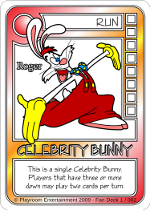 Which cards affect a “Halo’d” Bunny or the Holographic Bunny? While this card does not exist in the Creative Team Alpha canon, we wish it did. This site is designed to be compliant with World Wide Web Consortium (W3C) standards. If it doesn't look right, you're probably using Microsoft’s Internet Explorer. Please upgrade with Firefox, Opera, or Safari to be standards-compliant.